This is the original cult-hit wonder TAGAP: The Apocalyptic Game About Penguins, released in 2007. If you are looking for its 2017 sequel TAGAP 3, head to TAGAP 3 section. 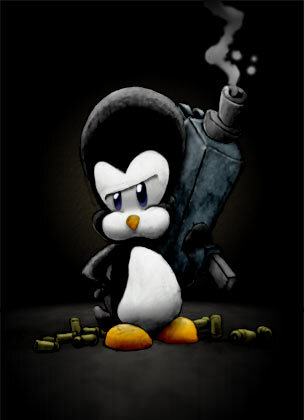 Penguins, pills and big guns! Mad scientist Dr. Glowenko is planning to take over the world with an army of bio-engineered cybernetic penguins. One of the penguins, codenamed Pablo, doesn't like the idea and escapes, only to find himself fighting against the whole clone penguin army, led by Pedro, another cyber-penguin. The fate of the world is in Pablo's flippers. TAGAP is a 2-D platformer shoot-em-up, but it plays more like a first-person-shooter. TAGAP is also about pills. There are different pills that are rewarded for in-game achievements, like hi-scores and killing spree combos. The drugs have different effects and side effects. As a result gameplay keeps switching from trippy slow-motion to fast-forward – and back. Turn the experimental drugs against you enemies; Become over-the-top, feel invincible and perform unnatural agility. Side effects do occur, shifting tempo and intensity of reality from high-speed to slowmotion – and back! There are plenty of weapons to choose from, all featuring two firing functions for all zombie-splattering needs. Spread havoc with everything from Uzis and shotguns to hi-tech artillery and even deadly combat vehicles! Evil penguins everywhere! Zombie penguins, killer penguins and even robot penguins of various sizes and forms are backed up by fierce automated turrets and weird robots. And leading the forces is Pedro the penguin, your nemesis! Gain rewards from performing well in-game; Scoring points, beating zombies, keeping up tempo – it all is rewarded with different pills and power-ups! Super-slick 2D gaming of retro design using effects arsenal of 3D acceleration combined with high-quality audio and music form a unique audio-visual experience! Craft you own worlds and adventures with built-in developer functions; Make your own levels with easy-to-use level editor, create new characters and weapons using TAGAP_Script scripting and do your own cut-scenes! Making game modifications has never been as easy!